Tour Scotland, Perthshire and Dunkeld. The name is derived from the Gaelic, Mhic Gille-brath, which means "son of the servant of judgement". The Mac Gillivrays were an important clan in the western isles even before King Somerled, Lord of the Isles, drove the Norsemen out of the area in the middle of the twelfth century. When Alexander II subdued Argyll in 1222, the Clann Mhic Gillebrath were dispersed. Some of the clan remained in Mull and Morvern. Tradition asserts that Gillivray, the progenitor of the clan, placed himself under the protection of the chiefs of the Clan Macintosh; the clan thereafter belonged to the Clan Chattan confederation. The Mac Gillivrays were first accurately recorded in Dunmaglas in 1549. At the great gathering of the Clan Chattan in 1609, when all bound themselves in loyalty to the young Mackintosh chief and in mutual support , the "haill kin and race of Mac Gillivray" was represented by Malcolm of Dalcrombie and Duncan Mac Farquhar of Dunmaglas. This is a classic example of the use of patronymics and the territorial designations common in the Highlands before the use of what would now be considered surnames became widespread in the eighteenth century. The Mac Gillivrays were supporters of an episcopacy in the church and this caused them to be persecuted by their Calvinist and Presbyterian neighbours. 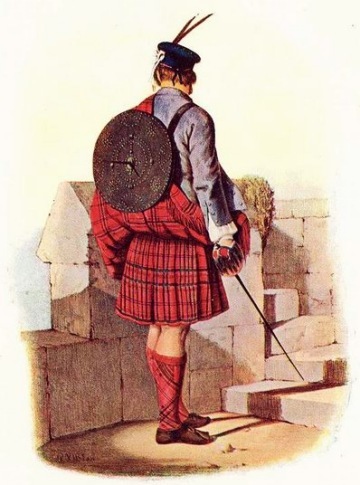 In common with most of the confederated Clan Chattan families, the Mac Gillivrays were staunch Jacobites, and they fought in both the Fifteen and the forty-five. In 1745, the chief of the Mackintoshes was an officer in a Hanoverian regiment. His wife, a formidable lady with distinct Jacobite sympathies, summoned Alexander Mac Gillivray and placed him in command of the regiment raised by Clan Chattan. Mac Gillivray was at the head of his men at Culloden where he fell along with many of his followers, and the graveyard at Dunlichity commemorates the many Mac Gillivray fallen. After Culloden, many emigrated across the Atlantic where their spirit of independence and fortitude made many successful, particularly as traders. William Mac Gillivray became head of the Canadian Northwest Company and member of the Legislative Council of Lower Canada. Another William Mac Gillivray published five volumes of The History of British Birds in the mid-1800's. The estates in Dunmaglas were sold off in 1890 and the last Chief is believed to have died in Canada. The Mac Gillivrays have become organized and active again in this century, and there are clan societies throughout the world.